"Oh, baby! The magic is back!" Mine is a minority opinion, perhaps, and no doubt it's got much to do with my intense loathing of Michael Jordan, but I would argue that Magic Johnson is in fact the greatest basketball player of all time. He won at every level, and he made the players around him better, and simply by being a 6'9" point guard, he changed the way the game is played. As you might imagine, this two-disc set from NBA Entertainment is basically a valentine to #32, and even if it's a by-the-numbers sports hagiography, it works pretty well. Danny Glover narrates as we follow young Earvin from the driveway where his father taught him the game, to high school, and then to Michigan State, where his Spartan team famously beat Larry Bird's Indiana State team in the 1979 NCAA championship game. But this being a product of David Stern's media monster, the action quickly moves to the NBA and Johnson's storied career with the Lakers�playing with Kareem Abdul-Jabbar and James Worthy, vanquishing first Julius Erving and the 76ers, then Bird and the Celtics, on the way to championships, until the Bad Boy Pistons plucked the crown from the Lakers. All the appropriate people are interviewed�Jud Heathcote, Jerry West, Byron Scott, Pat Riley, and so on�and they say all the predictable things. So if there's nothing revelatory here, it's a chance to revisit some of the glory years of the NBA, when games were still played in the Great Western Forum and the Boston Garden, the players wore what seem now like embarrassingly short shorts, and Johnson's public persona was carefully cultivated and happy go lucky, as for instance in a Nancy Reagan-inspired PSA: "Play it smart! Don't foul out with drugs." This film is clearly the product of an earlier time, because when the bad news comes�Johnson's 1991 announcement that he has tested HIV positive�somebody besides Glover takes over the narrative chores, and we whip quickly through Johnson's retirement and the 1992 All Star Game, followed by his playing for the U.S. team in that year's Olympics in Barcelona. There's a forced cheeriness to this that rings a little hollow�regardless of Johnson's medical condition, there was his brief and unsuccessful comeback, followed by his tenure as Lakers head coach, similarly brief and similarly unsuccessful. He maintains his famous smile throughout, but there's an undercurrent of something deeply wrong, and that's the status of his health. In many respects, then, the most moving thing here is not the documentary itself, but the footage (25m:27s) from the retirement ceremony of Johnson's number. This was at a time some fifteen years ago when a diagnosis of AIDS was close to a death sentence, when the cocktail of drugs now available to HIV+ patients was far off, and hence the whole ceremony is haunted by the specter of what we all anticipated would follow, the decline and untimely death of this man who had been the very paragon of vitality, here with his parents, his young son, and especially his pregnant wife. Johnson remains poised, but you can see the sadness lurking in him, his family, his colleagues, and the assembled NBA royalty�it truly rivals Lou Gehrig's farewell address at Yankee Stadium for poignancy, and no doubt at the time, and especially now, Magic Johnson considers himself the luckiest man on the face of the earth. Image Transfer Review: This looks like a straight dump job from a previous VHS release, and the print is pretty washed out throughout. The NBA does all sorts of things well, but cinematography seems not to be one of them. Audio Transfer Review: It sounds pretty muffled throughout, but it's not as egregious as the video. 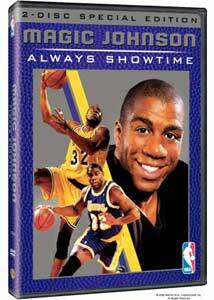 Extras Review: The documentary and the retirement ceremony are on the first side of the first disc, and the rest of the set consists of three complete NBA games. The first is Johnson's first game as a pro, played October 12, 1979, famous for his bear-hugging Jabbar at the end after making a last-second basket. Next is Game 6 of the 1980 NBA Finals, during which Johnson played the post, filling in for an injured Jabbar, and the Lakers clinched the title against Philadelphia. Finally, there's the 1992 All-Star Game, played just months after Johnson's first retirement and the announcement of his HIV status�he wins MVP honors and plays well, but you can't help but sense that everybody there wants to give the gold watch to the sick, older guy. It's nice to see these games on DVD, I suppose, but it's also a bit disappointing that a Johnson/Bird matchup, either on the collegiate or the pro level, wasn't included. A gee-whiz look at the greatest point guard ever to lace them up, with three vintage games in their entirety to bring the point home.